In bowl, combine flour and sugar, cut in butter until coarse crumbs. Press into greased 9×13 pan. Bake at 350 degrees for 10 minutes. Meanwhile, for filling, combine sugar and flour in a bowl. Whisk in cream and eggs. Stir in the rhubarb. Pour over crust. Bake 350 degrees for 40-45 minutes or until custard is set. Cool. For topping, beat cream cheese, sugar and vanilla until smooth, fold in whipped cream. Spread over top. Cover and chill. Cut into bars. Store in the refrigerator. 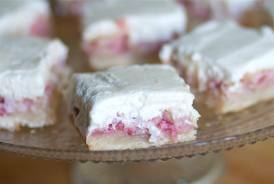 Sandy is FAMOUS for these Rhubarb Custard Bars… Delicious!